Papua New Guinea (PNG) defeated Vanuatu by ten wickets in the sixth match of ICC WT20 East Asia Pacific Qualifier, 2019 on March 24, Sunday. With this huge victory, Papua New Guinea has booked a spot in the ICC Men’s T20 World Cup Qualifier, which will be held later this year in United Arab Emirates (UAE). It was a comfortable win for the side as they chased down the target of 56/8 set by Vanuatu in flat three overs. 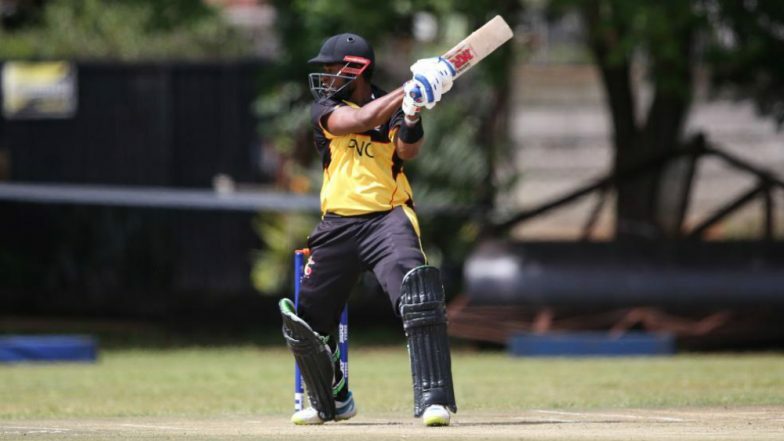 Tony Ura and Norman Vanua with their short but explosive batting got their side victorious in the competition, which had also featured the Philippines apart from the two sides participating on Sunday. ICC Men's T20 World Cup 2020 Full Schedule in IST Free PDF Download Online: Full Timetable With Fixture Dates, Match Timings, Venue Details of Twenty20 WC in Australia. The fight for the coveted one spot in the ICC Men's T20 World Cup Qualifier as the first of five T20 World Cup regional finals took place ended on a memorable note. The match between Papua New Guinea and Vanuatu was held at Amini Park, Port Moresby. Playing in front of the home crowd got the Papua New Guinea team in mood as they produced an all-round spirited performance. Batting first Vanuatu could manage mere 56 at the loss of eight wickets in 13 overs. Andrew Mansale, Vanuatu cricket team’s captain was the top-scorer for his side, making 10 runs. It was never going to be enough, but nobody anticipated PNG side to finish the match in just three overs. Their pair of opening batsmen, Tony Ura and Norman Vanua smashed Vanuatu’s bowler all around the park. While Tony made 24 runs off eight deliveries, his partner made 29 off 10 balls. Papua New Guinea chase down Vanuatu's 56/8 in just three overs to seal a spot in this year's ICC Men's T20 World Cup Qualifier in UAE. Eight of 25 teams from Africa, America, Asia, EAP and Europe Finals will join Hong Kong, Ireland, Netherlands, Oman, Scotland and Zimbabwe in the T20 World Cup Qualifier between October 11 and November 3 this year in the United Arab Emirates. The 2019 ICC T20 World Cup Qualifier is an upcoming cricket tournament scheduled to be held in October and November 2019 in the United Arab Emirates to determine which teams will qualify for the 2020 ICC T20 World Cup tournament in Australia.